We had another record breaking day with our running today, completing a whopping 491 km to bring our total distance up to 8,907 km. Everyone has certainly earned their weekend break after this effort. We have rested for the weekend in the town of Nuskhi in Pakistan. It is an area inhabited by many tribes which is surrounded by a desert to the north and west that leads to the Helmand river in Afghanistan. We have had to take a slightly longer route due to the mountains that are lying to the south and the difficulty in getting over them with the lack of passable roads. We had our first children to clock up an individual total of 42km today, i.e. a full marathon. Aaron and Isaac in Ciara Ronayne’s 3rd class and Jonah, Niks and Joe in Ellie’s 4th class (and possibly some other children around the school) reached this total today. To reach this distance some of these children are running up to 5 and 6 km per day during their allotted time with their class, which is a great achievement and a sign of how their bodies are adapting to the physical challenge. There is hope for us all. We ran a total of 388 km today bringing our overall total to 8,416 km. We broke the 8,000 km mark yesterday but we were so disorientated in the desert that we didn’t realise it until today. We have finally crossed into Pakistan, leaving Iran behind. We find ourselves in the border town of Taftan, which is the only legal and official crossing point between Pakistan and Iran (I gather there are several illegal and unofficial crossing points too). Today we completed another 385 km in blistering conditions here in the school which brings us ever closer to the border with Pakistan, but not quite over it yet. We find ourselves in the unusual (and possibly distressing) situation of not knowing exactly where we are on our virtual map (at least I can’t tell where we are on our map). There are no obvious cities, towns or even villages to speak of, other than to say that we are somewhere between Bam and Zahedan in south east Iran. Bam is an ancient citadel which experienced a devastating earthquake in 2003 while Zahedan is the regional capital and its name translates as “pious” from Arabic. Hopefully tomorrow we’ll be back on the grid. We are officially halfway through our marathon challenge and have amassed an amazing 7,703km so far. We are ahead of schedule in reaching our target of 13,000km by the end of June and we should reach this sooner than that. Today we completed a relatively modest 253km as we had several classes away on school tour. We have reached the city of Rafsanjan (population of 136,000), which (as we all know) is the centre of Iran’s pistachio cultivation and production. Very well done to all the children and staff for making it to the halfway mark! We are fast approaching the halfway mark of our marathon, with all of the children having now completed at least 20km (and some having done up to 30km). We ran 390km today, bringing our total to 7,060km. We have stopped for the bank holiday weekend in the desert city of Yazd, which is the 15th largest city in Iran with a population of just over half a million people. It has also been a UNESCO World Heritage Site since 2017 and is nicknamed “the city of the windcatchers”. We continued our journey through Iran today, adding another 465km (a new daily record distance) in very warm weather. We have stopped for the night in Kashan, a city of almost 250,000 people that has a history of producing high quality pottery and tiles. Thanks to everyone for their support and we’ll be in touch again for a last push before the bank holiday weekend. We had our biggest daily total today, covering a terrific 425km and bringing us across the border and into Iran. We have stopped for the night in the city of Hamadan, believed by many (including us here at Skerries ETNS) to be among the oldest cities in Iran with records of it being occupied by the Assyrians as far back as 11,000 B.C. We had another excellent day’s weather for our running today and if anything it was a little too hot. With our high temperatures today, it was quite fitting perhaps that we crossed the border into Iraq and we ended up in the city of Kirkuk where the average temperature in May is 34 degrees Celsius. We covered a total of 375km and our grand total now stands at 6,170km. Thanks for all the support and don’t forget the suncream for tomorrow! 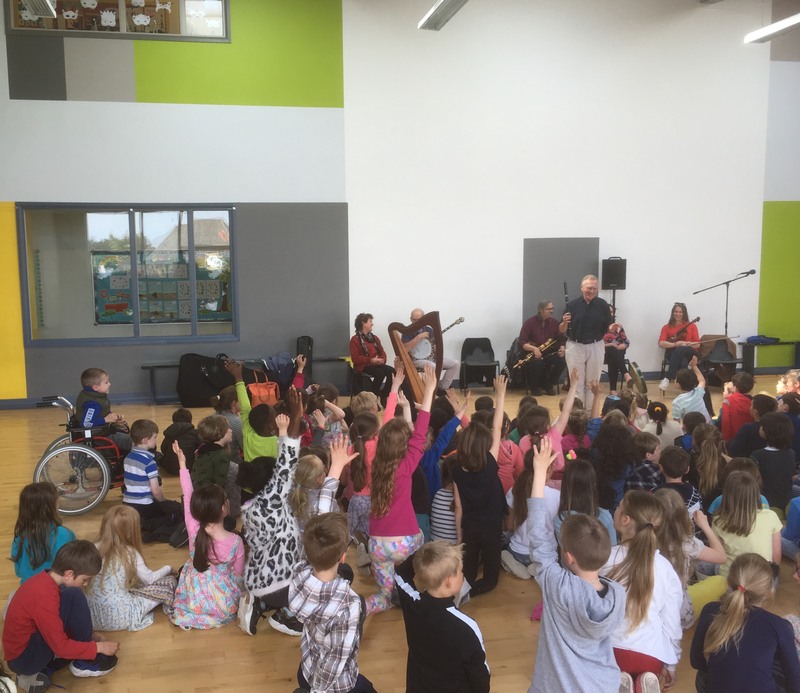 On Friday we added another 372km to our total distance, bringing us up to 5,400 km over the past 15 days of running, jogging and walking (although it is mostly running by the children at this stage). We find ourselves in the city of Urfa in south eastern Turkey and depending on our progress we will have another one or two days in Turkey before crossing the border into north western Syria. 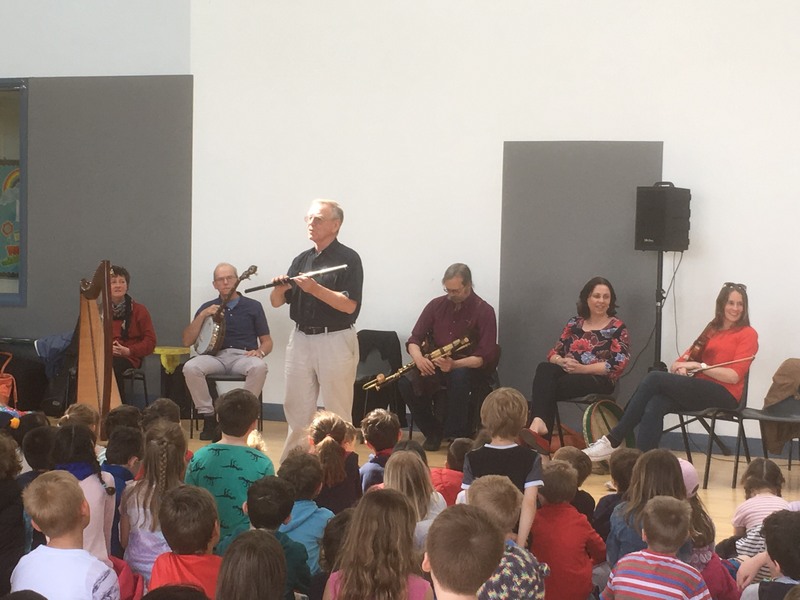 We were very fortunate to be visited by a group of musicians from Skerries on Friday last as part of the Skerries Traditional Music Festival 2018. The musicians brought a terrific range of instruments (including a harp, uileann pipes, a banjo, a violin, a flute and a bodhran) and in addition to playing a medley of traditional music for the children, there was an opportunity for the audience to hear about the history of each instrument and how it is made. The children certainly enjoyed it and there was plenty of clapping and stamping along with the music, which is always a good sign. 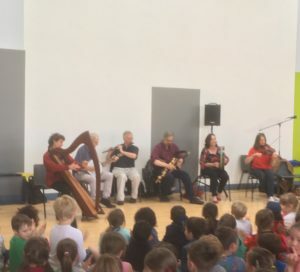 We’d like to say a big thank you to James O’Mahoney and the rest of the group for taking the time to come to the school and put on the performance for the children.